If it's true you only have a few seconds to grab a potential client's attention at a trade show, why not stand out in the crowd to ensure visibility! 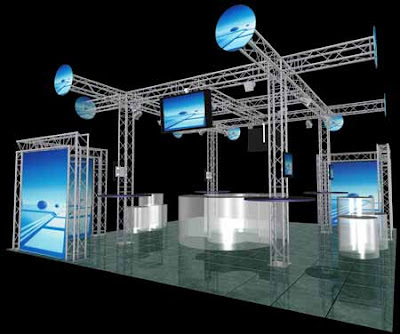 Here at DisplaysExhibits.com, we have exciting, new and fresh designs using top quality Milos truss. While a lot of companies feature "one stop shopping" we focus on the truss, the integral part of the booth. We make recommedations for graphics, shipping containers and custom cabinets to our customers that save them HUGE $$$$$. Why pay for graphics at a "one stop shop" that adds their margin on top? Why not put that money back in your pocket! Call us today at 888-804-0042 or email us at info@DisplaysExhibits.com to talk to a truss professional!